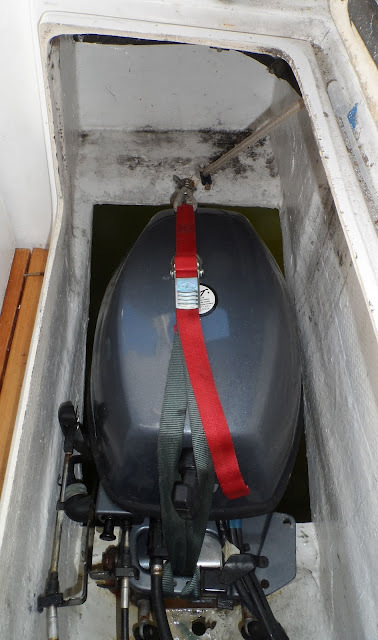 Just 4 years, and my new engines (Yamaha 9.9) don't want to lock down and lock up correctly. Corrosion, I'm sure. I've tried to keep them lubed, but no go. With my last engines I simply removed the locking pin (easy), used the rope to pull them up, and rigged a seatbelt strap to hold them down. It worked fine. Just wondering, any new ideas? I don't mind lifting the covers. I have manual chokes and I like to see the water running anyway. I threw the old seatbelts away, so I'll have to see what I can drum up for nothing. I posted this (below) in 2014 about the lock levers being so difficult to move from lock to lift and vice-versa. Maybe it relates to your problem. "… answering my own question so that others might benefit from my experience. I hope this is fixed for good. I pulled the engines and tried to disassemble the brackets but the tilt tubes would not budge. I did get to grease everything else and inspect closely but could not get grease under the tilt level. So I drilled two 1/8 inch holes in the lever collar and stopped when I hit the tilt tube. It turns out that the lever is reinforced plastic (delrin or marlin?) . Then I used a needle tip on the grease gun to grease the interface between the tilt tube and lever. I injected one hole and saw grease come out the second hole. After working it back and forth with the 6 inch wrench the squealing stopped and I could work the lever by hand. 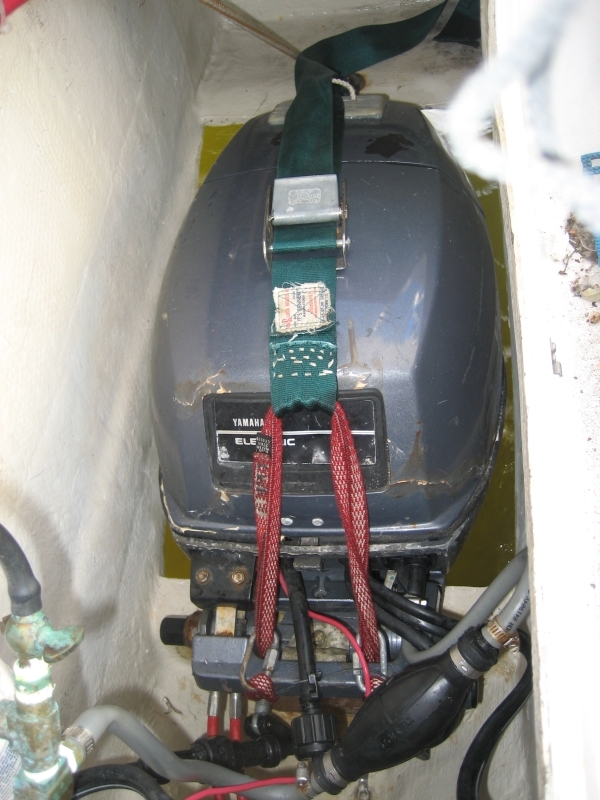 I think that tilt-tube corrosion is the culprit and regular greasing prevent this from happening again." Now since then, they got hard to move again so this time, I fabricated some 8 inch lever extensions from 1/2 g10 board and rigged a some fairleads so that I can flip the levers by pulling some strings. My motors lock down when the lever is in the right position but moving it there with just the 1 1/2" lever was too difficult Now I also rigged some small line and blocks to let me lift and lower without the back strain. I can take photos the next time I am on the boat. Just to be ready, I made up a pair of up-dated hold down straps. I tested them out and they work fine. These are simple to make from stuff you've got or can pick up at the corner hardware. Well, the bolt hangers are a climber thing, but you can get them on-line or make something. The blog post, below, explains it better. I have had some luck spraying penetrating cable lubricant up into the latch. Used canle lubricant because it is designed both to penetrate and lubricate. Needed several shots and workingthe lever. Not a permanent solution but can be repeated. ^^ I did that some at the same time I was sewing up the hold-downs (Corrosion Block). Either it worked (the latches were much better this time out) or the threat of my preparations and impending surgery scared the engines. I think it was the latter.